22. Optional: Script to cross-check the installations. That's it already - /etc/apache2/conf-available/squirrelmail.conf defines an alias called /squirrelmail that points to SquirrelMail's installation directory /usr/share/squirrelmail. echo "You need to install these packages. To install these packages you need to run the command apt-get install package_name"
If it is showing the package_name then you can ignore the package." echo "Congratulations you have installed all the packages successfully"
If it is showing the package_name then you can ignore the package. 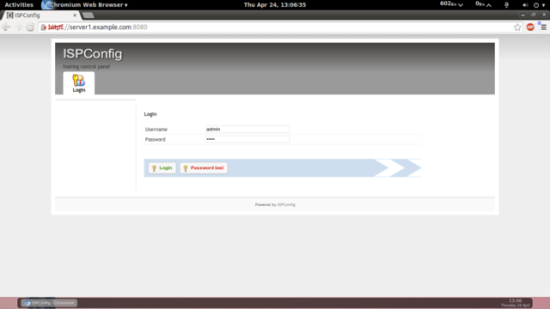 Packages php-auth and php-pear alleady installed. maybe you made a mistake while you edited the my.cnf file. I am amazed on how you could explain step by step this issue. I've followed each one of them and everything worked well in the end. Thanks for the excellent tutorial. Trying to get the manual but link seems to be broken or the pdf is damaged. Anyway, using the ISPConfig beats using MAC OS X Server for Mavericks hands down. Have used Falkos other guides in the past and they always work. Wanted to say big thank you once again. Appreciate the hard work. 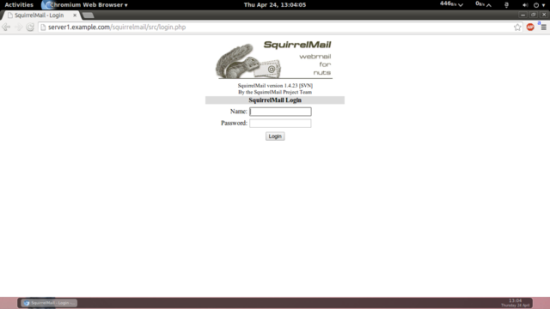 Alias /webmail /usr/share/squirrelmail. If you add an alias Alias /mail /usr/share/squirrelmail, the panel disappears Possibility to create e-mail domains ...Thanks for a great manual! I followed your complete tutorial without any error But when I'm accessing ispconfig as http://domain.com:8080 or https://domain.com:8080 then nothing works. Can you please guide me how can I fix it? I'm stuck not to trace it. I follow your steps under Windows Azure Virtual Machine. The package postfix-mysql i could install. So that issue was fixed. However, the packages php-auth and php-pear result as already installed when i do an apt-get install on them. But cross-check script shows they are missing. I don't want to go and install ispconfig3 with this error showing and i have checked everything a zillion times now ...arrggg..
NB Squirrel mail is working. then you can ignore the error from cross check and proceed with the ispconfig installation. I have gone through with the proceedure to install ispconfig a few times. My comment is it is difficult to get everything right, especially if you have two-fingered typing skills like me. This allows you to see the system log responses to all the commands you enter. Thus, if you make a mistake, you can see the error messages. Perhaps you could in some way use this in your install procedure to allow the 2-fingered typists to get feedback vis-a-vis their typing errors before the whole install gets messed up ? The install guides are made in a way that you can copy the command lines right to your shell window, so nearly no typing is required. The only cases were you have to type something in is when your Domain Name or IP address are required for an file. If you have a Windows Desktop, then you can use putty to connect to your Server and copy / paste the commands. I have installed ISPConfig3 on Ubuntu14.04 LTS following this guide, I have everything working except for the "Email" section/tab on the ISPConfig admin. When I click on the "Email" tab I get the left sidebar opened, but when I click on any of the menu items of the sidebar like Domain, Mailboxes etc, nothing shows up on the right. I don't know what I have done wrong. So now I can not add email domains and user email boxes and I cannot do anything under the "Email" Section. During setup, the only file I failed to get is the apache2.2-common, it was the only one not available on my sources. I guess you created a alias /mail instead of the alias /webmail for squirrelmail. a alias /mail will override the mail module from ispconfig and Forwards all requests to squirrelmail instead. I have followed this guide 4 times from scratch and every single time I am unable to receive email from outside sources. I can send fine, and I can receive email from my own server but not any email from outside of my server. Probably a firewall issue. Try to access your server from outside using telnet like this. If you can't contact it then you know your ISP is blocking port 25. Please help. What did I miss? I had the same thing happen, no question for installing SSL. It seems that SSL is now installed by default. I can access my server just fine on https://myserver.com:8080. The error you received says that it is SSL enabled so maybe an issue with your browser. where is the roundcube installation ? Then change the number to "2", instead of 1 or 0. 0 will not allow TLS connections, only plain FTP. 1 will allow both plain FTP and FTPS. 2 will only allow FTPS connections. Hi, great tutorial as always. Thanks. I follow this tutorial but it works now i can access my SquirrelMail and ISP config 3. I can use to send email locally but the problem is how can i send email to my gmail and my yahoomail?..i always encountered this error?. . 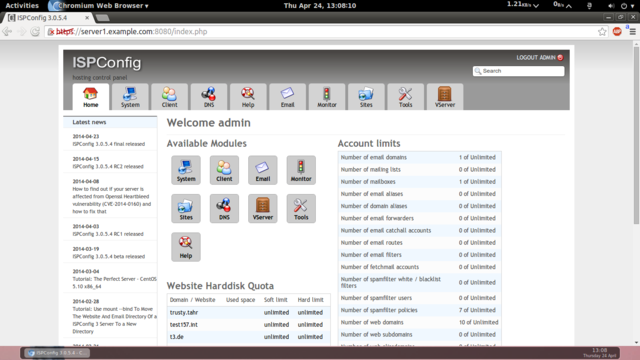 This is the mail system at host mail.openlook.com.